Expat Life? There Must Be an App for That! 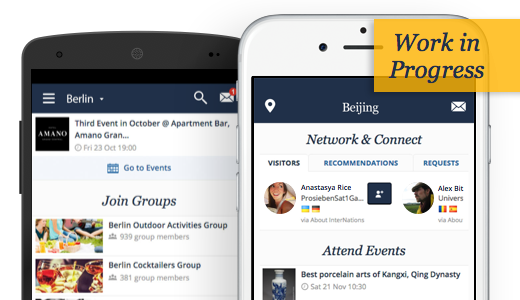 “Why is there no InterNations mobile app?” or “when is the app coming?” are questions we’ve been hearing a lot, whether in our forum, at official events, on social media, or simply as part of the feedback we have received from our members in the course of our ongoing website relaunch. Of course, the high demand for a mobile app doesn’t come as a surprise. The share of devices used to surf the web is shifting more and more towards mobile, be it tablets or mobile phones. 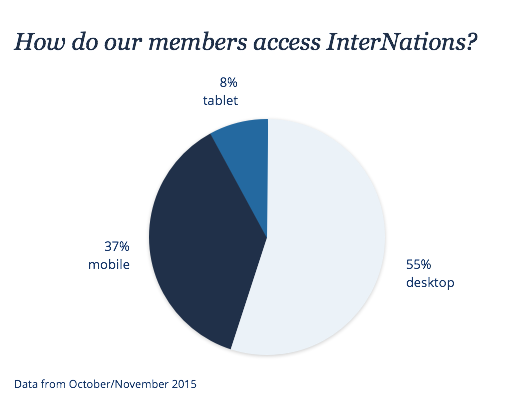 We have also observed this trend on InterNations: the percentage of members visiting our website from mobile devices is increasing constantly. Last month, for instance, only just over half the logins on InterNations were still made through desktop computers. This is hardly surprising, considering not only the general trend, but particularly the international and mobile lifestyle of our members! This year has been a busy one for InterNations, with an ever-growing member base and the relaunch of the platform keeping us here at headquarters on our toes. However, it is this relaunch and the fact that our website is now being mobile optimized that has paved the way for the long-awaited app! Expat life? There will be an app for that! Hi – is there an update on the release timeframe for the mobile app? At least a rough guidance (Q2, Q3) would be helpful. The release of the mobile app is definitely our top priority right now. We’ll let you know once we have a specific date. When are we likely to see this app hit the stores – 2016? 2017? It’s from last year but it is indeed good news. But why don’t you create an API instead? So 3rd party apps such Windows 10 or future devices will be covered? We wanted to first focus on the devices that most of our members use. Let’s see how this goes! So glad you’ll soon have an app. We’ll definitely keep you in the loop about the upcoming app! Thanks for the feedback! We’ll keep you updated. Am so grateful that the world is now finally catching up to mobile including their websites. It gets very frustrating as an early adopter! Glad you are using your analytics to track. The redesigned features issued during our ongoing site relaunch are also mobile-friendly, but hopefully, the upcoming apps will provide an even better user experience for members with smartphones or tablets. For the moment, we’re focusing on Android on iOS, but we’ll keep you updated if Windows 10 should be added to the mix as well. Can’t wait for that! !happy there will be soon an app. We’re glad to hear that. We’ll keep you updated! We have an APP for foriegners in Hefei,Anhui, China. You may be interested in viewing. Of course we are interested in cooperating however we can. We also have an agreement with NiHao APP, also worth viewing. Would you need help with beta testing of the app?